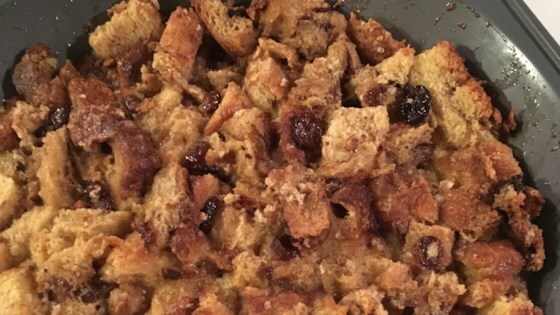 "A delicious, easy to make Bread Pudding. Enjoy!" Preheat oven to 325 degrees F (165 degrees C). Spray one 9 inch pie dish with non-stick coating. In a large bowl, beat together the eggs and egg whites until foamy. Mix in the milk, honey and vanilla. Stir in the bread cubes and pour into pie dish. Bake for 30 to 35 minutes or until knife inserted in center comes out clean. Serve warm. I used 3 whole eggs & more bread. Didn't measure the honey or vanilla. It's a great basic recipe to play with! Sorry, but I would never make this again. The recipe totally lacked any kind of flavour. Very warm and delicious desert! I added 2 Tablespoons of maple syrup just for added flavor. It was so good!